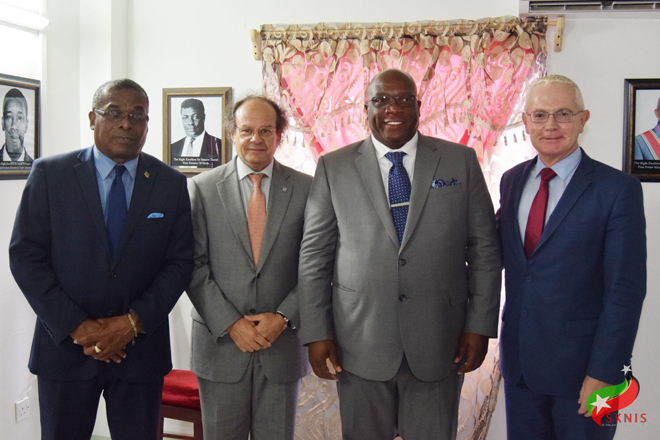 BASSETERRE, ST. KITTS, OCTOBER 8TH, 2017 (PRESS SEC) – Prime Minister Dr. the Honourable Timothy Harris and the Honourable Ian Patches Liburd, Minister of Public Infrastructure et al., held a bilateral meeting yesterday, Saturday, October 7th, 2017, with France’s Ambassador to St. Kitts and Nevis, His Excellency Mr. Philippe Ardanaz, and French Foreign Trade Advisor, Mr. Jacques Chouraki. During the meeting at Camp Springfield both parties reaffirmed their support for geothermal energy development in the Federation of St. Kitts and Nevis. Mr. Chouraki, the French Foreign Trade Advisor who sat beside the Ambassador, is the President of Teranov Geothermal Energy. Teranov, a French engineering and services company for new and renewable energy, specializes in high enthalpy geothermal energy development in the Caribbean and Latin America. The company is based in Guadeloupe and Colombia. Prime Minister Harris’ administration has been working with Teranov to examine the technical feasibility and economic viability for geothermal power in the country, as it is hoped that, by the year 2020, nearly 100% of the electricity supplied in the Federation would be produced from renewable energy sources as opposed to expensive imported fossil fuels. The Caribbean region’s annual fuel import bill is put around US$9 billion per year. Against this backdrop, Minister Liburd signed a Memorandum of Understanding (MOU) with Teranov in September 2015 on behalf of the Government, and two months later geothermal exploration exercises began in the Sandy Point area around Brimstone Hill, going to the top of the nearly 3,800 ft. Mount Liamuiga. 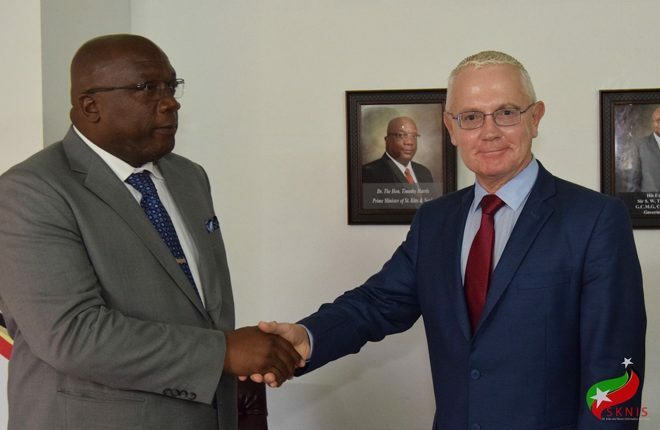 Teranov found that there is potential in St. Kitts to develop at least 18 to 36 megawatts of geothermal power. This is significant, partly because geothermal is considered to be an ideal, hurricane-proof source of energy unlike above ground power lines. Case-in-point: Right after the passage of Hurricane Irma, Bruce Cutright, CEO of Texas-based Thermal Energy Partners (TEP), which is developing a geothermal power plant with an initial capacity of 10 megawatts on the island of Nevis, reported that the power plant had dodged significant damage and only suffered some soil erosion from the hurricane.